Garden windows prices vary dramatically and can cost between $650 and $4,500 - including installation. 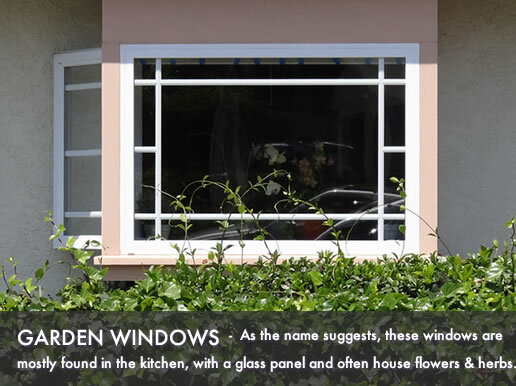 As the name suggests, these windows are mostly found in the kitchen area and include an overhead glass panel and often house flowers or herbs on the window sill. The prices are determined by a number of factors including the size of the window, the hardware you choose, the glass and frame materials and the price for the installation itself. Entry level garden windows will be for a premade, smaller sized unit (36"w by 48"h) with a vinyl frame. Expect a low end low-e glass package, limited frame colors, plastic hardware etc. The frame will be a fixed - meaning you will probably not have any options to open the window to allow air to flow through the area. Mid-range garden windows will usually offer more choices of frame materials - from a top of the line vinyl to fiberglass to composite or aluminum. These units will be bigger generally and may include some nice enregy efficient upgradess, as well as a side casement or awning for ventilation options. Higher end garden windows are usually offered in a wood clad or fiberglass frame. These windows may include a number of options and upgrades when it comes to frame color and finish, as well as the glass package. In many cases, these may be custom built windows made to your specifications. Installation pricing range from $150 to $1,000 for each window. This price is determined by the amount of work that is needed to replace the window. A simple replacement will cost considerably less than if you are using a larger frame or the opening needs widening and the area needs reinforcing. Entry level pricing start at $650 and top out at $900 for each installed window. Mid-range pricing start at $900 and top out at $2,400 for each installed window.